Houston gardening supports the chosen expression of the lifestyle of the client by reflecting the primary emblem of the lifestyle: the home itself. The geometry and size of the garden, along with its content, reflect the architectural features and stylistic attributes of the house. Cultural and historical forms are used in Houston gardening when the architecture of the home calls for a specific historical period or human culture to be clearly represented on the landscape. 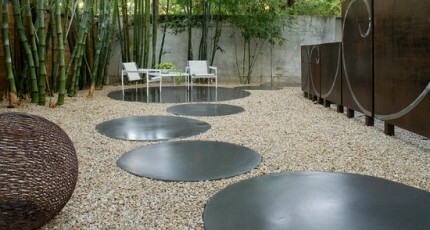 Perhaps one of the most popular Houston gardening styles is the modern or contemporary garden. This garden design minimizes vegetation and emphasizes states of consciousness through geometric shapes and unique decorative elements. These gardens are based on linear movements and radiuses that challenge the mind to see beyond assumption. The garden’s uniqueness is then magnified even further with inorganic decorative elements that convey movement and light. Fountains, glass, mirrors, and stainless steel decorative posts are commonly used in contemporary Houston gardening to create a multi-dimensional gallery of light, fluidity, stone, and occasional greenery. A garden like this is ideal for any contemporary home that wishes to extend its abstract aesthetic into the surrounding property. It also works very well in corporate landscapes where a deliberately less-is-more approach to décor conveys gravitas and professionalism. French garden design supports the feeling of being on an 18th Century estate measured and spaced with gravel pathways and dark green hedgerows. Flowering plants are minimal because of the French tendency to emphasize sculpted forms over excessive, bright colors. French architecture is very popular in this part of the world because of our proximity to Louisiana and the early cultural ties between Old Galveston and New Orleans. Houston gardening specialists have planted French style parterre gardens and formal French gardens in neighborhoods throughout Beaumont, Houston, and Galveston. The French style does not have to be limited to a French style home, however. Originally, French gardens were planted on enormous estates. This makes any French derivative appropriate for any large Houston estate in neighborhoods such as River Oaks, Tanglewood, and Royal Oaks. English gardens are also very colorful because the English love color far more than the cultural stereotype may suggest to the uninformed. As interest in pre-Roman England has increased in the past few centuries, recognizably Celtic themes have become even more pronounced in English gardens. Any simple home or townhouse on a smaller lot can be magnified in beauty and prestige with the addition of an English garden or English knot garden in the front of the yard. A backyard behind such a home can become a world of color and scent where the size of the property becomes irrelevant in comparison to the feeling of being the modern equivalent of a mythical dream world. Italian forms are a blend of Roman forms and a diversity of other forms that originated from both pre-Roman and post-Imperial Italian people groups. Due to Italy’s magnificently complex and diverse history, all of these many styles have coalesced into a garden discipline founded on the order and discipline of Old Rome, but also enhanced with the unique blend of simple living, stimulation of sense, and private romantic adventure that we associate with the Italy of today. Italian gardens work very well in areas like the Heights, where homes appear taller than they are wide. They also are one of the few garden forms that Houston gardening specialists can build above ground level. It is not uncommon to see an Italian garden on a terrace or rooftop on some of our city’s multi-story homes. Mediterranean gardens are primarily based on ancient Greek and Roman elements that were later influenced by selective Moorish and Arabic designs. In Ancient times, these gardens were built on hillsides overlooking the sea. In spite of all the wars that raged along these coastlines, these gardens always seemed to represent the peace and tranquility of simple ocean-side living, and the day to day life of people who simply loved being where they were. To this day, they continue to convey a similar sense belonging, peace, and relaxation to the mind. Because of its strong Classical undertone, today’s Mediterranean garden will look good around any number of home architectural styles. Obviously this design is ideal for a Mediterranean style home or a home with strong classical elements like columns. However, Houston gardening experts from our company have also successfully planted a number of Mediterranean gardens around contemporary and modern style homes. The Mentalist emphasis of modern landscape design is nicely complimented by an archetypal form that is world renowned for relaxing the mind. Japanese gardens were originally planted on the estates of the Shogun lords to function as private paradises. Incorporating a blend of Shinto and Buddhist elements, the Japanese garden is meant to be both a private retreat for the battle-weary and a promise of Utopia someday for those who never give up hope on a better world. In Houston gardening circles, Japanese gardens become more and more popular every year for two reasons. Some people deliberately choose them as a reflection of Easter spiritual values they have adopted. Others want a Japanese garden for the same reason that the old Shogun lords wanted them. After a day of heavy fighting in the office and the traffic, peace of mind on any level is a welcome retreat from a world obsessed with ideations of victory and constant demands for tangible evidence of productivity. 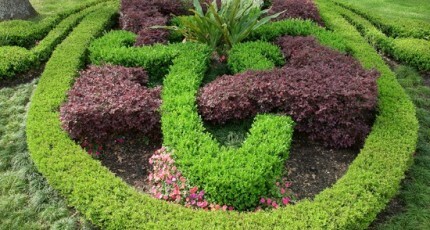 A knot garden features a formal boundary and an interior composed of any number of plant types. Vegetation may take the form of herbs, or it may consist of a variety of ground cover shrubs. Occasionally, very small trees are planted in the larger gardens. Flowering plants are not commonly used because different shades of green are used to create the many layers of color within the garden’s interior.